Mandy-Rae Krack, a seven-time world record freediver and ocean advocate, says her biggest concern is that not enough people care about the ocean. Her mission is to convey to the public her own love of the sea. Mandy-Rae Krack, a seven-time world record freediver and ocean advocate, has a special connection to the deep, blue sea. "It's this sense of calm and belonging," she told CBC's Metro Morning on Monday. "[The ocean] draws you in and makes you want to come back." Krack, who lives in Campbell River, B.C., is in Toronto to speak at a conference that focuses on Canada's pledge to safeguard 10 per cent of its oceans by 2020. She says her biggest concern is that not enough people care about the ocean. Her mission is to convey to the public her own love of the sea. "It always surprises me how many people I meet that have never ventured underwater," she said. "I'm a true believer that if you have a personal connection to something you're going to want to take care of it more." Krack is a fierce advocate for the world's oceans. She was part of the black-ops team that helped expose the dolphin slaughter in Japan, which was documented in the 2010 film The Cove. "We breathe because of our oceans," she said. The Canada's Oceans: Towards 2020 conference starts Monday night at the Royal Ontario Museum with Krack speaking alongside Alexandra Cousteau, the granddaughter of Jacques-Yves Cousteau and a National Geographic Emerging Explorer, filmmaker and globally recognized advocate on water issues. Tuesday's symposium will include a collaboration between scientists, policy makers, ocean users, artists, and the public to discuss achieving Canada's marine conservation targets. Freediving is essentially "deep snorkeling," explains Krack. The diver wears a fused flipper on both feet, known as a monofin. Krack's deepest dive was to 136 metres. That's 447 feet straight down from the water's surface in one breath. She used a weighted sled to get to that depth, and a lift bag or balloon to get back to the surface. What she's most proud of is a dive to 88 metres, or 289 feet, which she accomplished by using her own propulsion. The longest Krack has held her breath, called static apnea, for is six minutes and 25 seconds. She's broken both the world and Canadian national records for a breath-hold. In 2006, she and her husband, Kirk Krack, worked with magician David Blaine to train for a world record breath-hold and a television special called Drowned Alive. 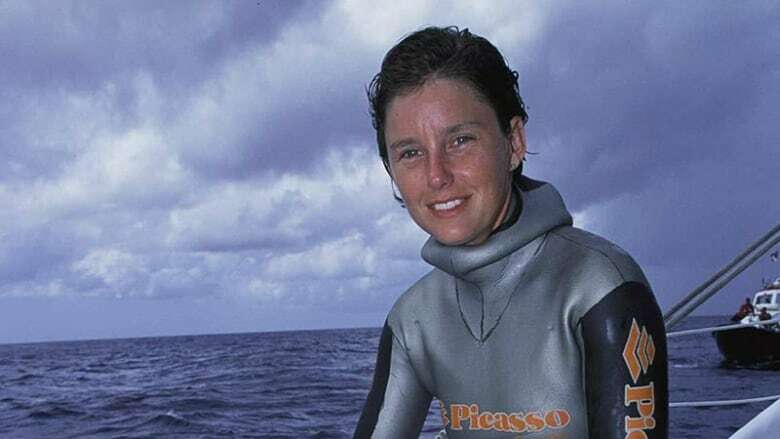 Krack was a scuba diver first, but it was the oxygen tank-free experience of freediving that led to deepening her connection to the ocean. "On a freedive, the ocean really comes alive. You can hear things that you can't hear when the bubbles are coming out of your scuba tank," she said. "The aquatic life is so much more interactive with you, they're not scared of you. So you can really get close to everything and you really feel like you belong down there."